In 2015, the Russian Finance Ministry may resume the issue of short-term government bonds (GKOs) to plug holes in the budget resulting from falling oil prices. Although the Russian authorities issued the same bonds in 1998, when the country suffered the most severe financial crisis in its modern history, analysts say the move is sensible, as long as the financial situation is carefully monitored. The Russian Finance Ministry has announced that it may resume the issue of short-term government bonds (GKOs) in 2015. The bonds will help to plug holes in the budget that may arise due to falling oil prices, and will be made available to private individuals and institutional investors, including foreign companies. The announcement was made by Deputy Finance Minister Tatyana Nesterenko at a session of the budget committee of the upper house of the Russian parliament, the Federation Council, on Nov. 24, as reported by Russian news agency TASS. Nesterenko said that GKOs will be used not to cover a budget deficit but only as a short-term instrument for raising funds to fill financial holes. Earlier, Finance Minister Anton Siluanov said that in 2015 the federal budget account at the Treasury may end up without a clear balance either in rubles or in dollars that could be sold at deposit auctions. “Short-term government bonds will be used to plug cash gaps rather than to cover a budget deficit. Furthermore, GKOs are proposed to be used just two-three times a year,” says Dmitry Bedenkov, head of research at investment company Russ-Invest. To that end, the Finance Ministry will reserve up to 600 billion rubles ($11.5 billion) in the federal budget account, he explains. “If the declared purpose of the issue is adhered to, there are no risks for the stability of the financial system. However, one should take into account a potential deterioration of the financial situation, which will require a high level of control over the issue process,” Bedenkov adds. Having said that, he continues, at a time when it is necessary to even out a debt burden and allocate it within a narrow time range, short-term government bonds are the most convenient instrument to use. Konstantin Korishchenko, head of the stock market and financial engineering department at the Russian Presidential Academy of National Economy and Public Administration, agrees with Bedenkov’s assessment. “In the present circumstances, when credit interest rates are growing and the national currency rate is changeable, the need for government bonds will only increase, as it is the main instrument for bank refinancing,” says Korishchenko, who formerly served as deputy chairman of the Russian Central Bank. According to him, a short-term government bond issue is a sensible compromise between the Finance Ministry’s unwillingness to engage in long-term and expensive borrowing on the market and banks’ desire to acquire a liquid and profitable asset. “It is a sensible decision, which – together with other solutions – should help bring the situation on the financial market back to normal,” Korishchenko concludes. Short-term bonds were first issued in Russia in 1993. There came in two varieties: three-month and six-month bonds. Some of the funds that the Finance Ministry raised from selling those bonds were used to patch up budget deficit. However, budget revenues were insufficient to redeem earlier issues and the Finance Ministry had to issue more bonds. In 1996, the GKO market became open to foreign investors, albeit with some restrictions. In particular, funds received on the redemption of government bonds could be taken out of the country only in a year’s time. Later, these restrictions were lifted. By 1998, yields on short-term government bonds reached 140 percent a year and GKOs covered practically the whole of Russia’s budget deficit. As a result, on Aug. 17, 1998, the government defaulted on those bonds, resulting in the most serious economic crisis in Russia’s modern history and a record-breaking depreciation of the ruble. While on Aug. 15, 1998, on the eve of the crisis, the official ruble rate was 6.3 rubles to the dollar, by Oct. 1, it had grown to 15.9 rubles, i.e. by about 150 percent. “What happened in Russia in 1998 was a far more complex process than is suggested by the talk of a GKO pyramid or any other economic construction. Those problems had to do with the problems of the budget, falling oil prices, a fixed ruble rate and many other things, rather than just the GKO debt,” says Konstantin Korishchenko. Later, after a certain delay, the state fully redeemed short-term bonds belonging to private individuals and a few mutual funds, while all the others received less than 30 percent of the securities’ nominal value. 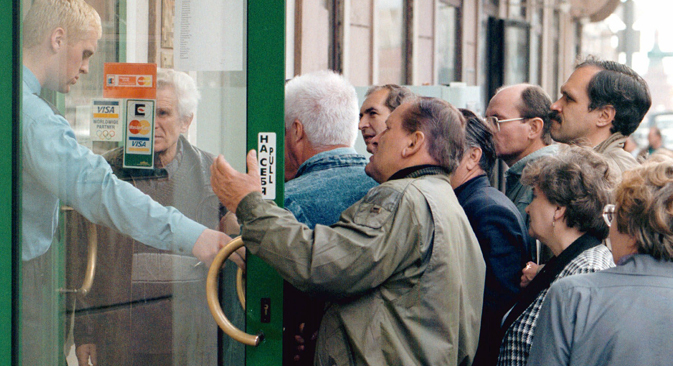 Nevertheless, after the 1998 crisis, the Russian government resumed the practice of GKO issues, with the last auction conducted in February 2004. After that the Finance Ministry reduced the program of borrowing on the domestic market thanks to high budget revenues, fuelled, among other things, by rising oil prices.